COMM 0030 is a level two course that provides opportunities for individuals working in business, technical, and health fields to improve their listening and speaking communications skills for successful participation in both BCIT courses and the workplace. The course emphasizes language required for trades, business and science/technology environments, as well as the jargon of specific fields of study and work. It concentrates on pronunciation and intonation as well as on-the-job speaking skills. Individuals will study and practice the essential aspects of speaking and listening in English and develop proficiency in conversation, group discussion, meetings, and interviews. Extensive out-of-class resources such as audio laboratory and online assignments will assist students in broadening their knowledge of specific communications skills required for the workplace. Students can take this course as an option to meet the Speaking and Listening requirement to enter BCIT programs. NOTE: Seat availability is limited and registration is on a first-come-first-serve basis only. We do not guarantee or reserve seats for students with no exceptions. Please also be mindful that taking the COMM 0033 test and receiving a placement does NOT guarantee students a seat for a course in the next available term/schedule. Financial aid is also available for this course. Please refer to the following website: https://www.bcit.ca/finaid/abesap.shtml for more information. Your application must be submitted NO LATER THAN THE FIRST DAY OF CLASS. Effective September 1, 2017, the tuition portion of this course is free for Canadian Citizens and Permanent Residents. Please note: ancillary fees such as Student Association fees, BCIT ID card fees, etc. will be charged and must be paid. All course registrations work on a first-come first-served basis only. Seats will NOT be guaranteed or reserved for students with no exceptions. There is no waitlist for this course. We recommend students check our course website frequently for updates on seat availability. STUDENTS MUST GET APPROVAL FROM THE DEPARTMENT TO REGISTER FOR THIS COURSE. Please read the prerequisites above. Students who pass COMM 0033 with a mark of 60 or higher OR receive a “Satisfactory (S)” mark in COMM 0029 will automatically be approved to register for COMM 0030. If you have a valid IELTS, TOEFL, CLB, or LINC score, please send a copy of it to PELD@bcit.ca along with your BCIT student number for course registration approval. Note: Attendance is mandatory for ALL classes. If you are unable to attend the first class, please be sure to email PELD@bcit.ca to inform the department; otherwise, you may be dropped from the course WITHOUT notice. All course registrations work on a first-come first-served basis only. Seats will NOT be guaranteed or reserved for students with no exceptions. There is no waitlist for this course. We recommend students check our course website frequently for updates on seat availability. CLASS on August 12 will run from 5 pm to 8 pm. Effective September 1, 2017, the tuition portion of this course is free for Canadian Citizens and Permanent Residents. Please note: ancillary fees such as Student Association fees, BCIT ID card fees, etc. will be charged and must be paid. All course registrations work on a first-come first-served basis only. Seats will NOT be guaranteed or reserved for students with no exceptions. There is no waitlist for this course. We recommend students check our course website frequently for updates on seat availability. STUDENTS MUST GET APPROVAL FROM THE DEPARTMENT TO REGISTER FOR THIS COURSE. Please read the prerequisites above. Students who pass COMM 0033 with a mark of 60 or higher OR receive a “Satisfactory (S)” mark in COMM 0029 will automatically be approved to register for COMM 0030. If you have a valid IELTS, TOEFL, CLB, or LINC score, please send a copy of it to PELD@bcit.ca along with your BCIT student number for course registration approval. Note: Attendance is mandatory for ALL classes. If you are unable to attend the first class, please be sure to email PELD@bcit.ca to inform the department; otherwise, you may be dropped from the course WITHOUT notice. All course registrations work on a first-come first-served basis only. Seats will NOT be guaranteed or reserved for students with no exceptions. There is no waitlist for this course. We recommend students check our course website frequently for updates on seat availability. Effective September 1, 2017, the tuition portion of this course is free for Canadian Citizens and Permanent Residents. Please note: ancillary fees such as Student Association fees, BCIT ID card fees, etc. will be charged and must be paid. All course registrations work on a first-come first-served basis only. Seats will NOT be guaranteed or reserved for students with no exceptions. There is no waitlist for this course. We recommend students check our course website frequently for updates on seat availability. STUDENTS MUST GET APPROVAL FROM THE DEPARTMENT TO REGISTER FOR THIS COURSE. Please read the prerequisites above. Students who pass COMM 0033 with a mark of 60 or higher OR receive a “Satisfactory (S)” mark in COMM 0029 will automatically be approved to register for COMM 0030. If you have a valid IELTS, TOEFL, CLB, or LINC score, please send a copy of it to PELD@bcit.ca along with your BCIT student number for course registration approval. Note: Attendance is mandatory for ALL classes. If you are unable to attend the first class, please be sure to email PELD@bcit.ca to inform the department; otherwise, you may be dropped from the course WITHOUT notice. All course registrations work on a first-come first-served basis only. Seats will NOT be guaranteed or reserved for students with no exceptions. There is no waitlist for this course. We recommend students check our course website frequently for updates on seat availability. This course runs concurrently with the BMS program. Effective September 1, 2017, the tuition portion of this course is free for Canadian Citizens and Permanent Residents. Please note: ancillary fees such as Student Association fees, BCIT ID card fees, etc. will be charged and must be paid. All course registrations work on a first-come first-served basis only. Seats will NOT be guaranteed or reserved for students with no exceptions. There is no waitlist for this course. We recommend students check our course website frequently for updates on seat availability. STUDENTS MUST GET APPROVAL FROM THE DEPARTMENT TO REGISTER FOR THIS COURSE. Please read the prerequisites above. Students who pass COMM 0033 with a mark of 60 or higher OR receive a “Satisfactory (S)” mark in COMM 0029 will automatically be approved to register for COMM 0030. If you have a valid IELTS, TOEFL, CLB, or LINC score, please send a copy of it to PELD@bcit.ca along with your BCIT student number for course registration approval. Note: Attendance is mandatory for ALL classes. If you are unable to attend the first class, please be sure to email PELD@bcit.ca to inform the department; otherwise, you may be dropped from the course WITHOUT notice. All course registrations work on a first-come first-served basis only. Seats will NOT be guaranteed or reserved for students with no exceptions. There is no waitlist for this course. We recommend students check our course website frequently for updates on seat availability. NO CLASS ON MAY 18 and 19. Effective September 1, 2017, the tuition portion of this course is free for Canadian Citizens and Permanent Residents. Please note: ancillary fees such as Student Association fees, BCIT ID card fees, etc. will be charged and must be paid. All course registrations work on a first-come first-served basis only. Seats will NOT be guaranteed or reserved for students with no exceptions. There is no waitlist for this course. We recommend students check our course website frequently for updates on seat availability. STUDENTS MUST GET APPROVAL FROM THE DEPARTMENT TO REGISTER FOR THIS COURSE. Please read the prerequisites above. Students who pass COMM 0033 with a mark of 60 or higher OR receive a “Satisfactory (S)” mark in COMM 0029 will automatically be approved to register for COMM 0030. If you have a valid IELTS, TOEFL, CLB, or LINC score, please send a copy of it to PELD@bcit.ca along with your BCIT student number for course registration approval. Note: Attendance is mandatory for ALL classes. If you are unable to attend the first class, please be sure to email PELD@bcit.ca to inform the department; otherwise, you may be dropped from the course WITHOUT notice. All course registrations work on a first-come first-served basis only. Seats will NOT be guaranteed or reserved for students with no exceptions. There is no waitlist for this course. We recommend students check our course website frequently for updates on seat availability. CLASS on June 18 will run from 5 pm to 8 pm. Understand conversations, discussions, interactions and lectures at a normal rate of speech. Understand and use the language and vocabulary of business, trades and technologies, including terms, idioms, colloquial expressions and technical terminology that may be unfamiliar or low frequency. Participate actively and appropriately in conversations, group discussions and other interactions. Exhibit appropriate language choices, including register (level of formality) and tone for a variety of academic and workplace situations. Use a range of grammatical structures with infrequent and/or minor errors that do not impede meaning present business and/or technical information extemporaneously. Present business and/or technical information extemporaneously. Take effective notes in various academic situations, for example, lectures, presentations, videos, etc. Improve pronunciation skills including linking, rhythm, syllable stress, intonation, formation of vowel sounds, the schwa vowel sound, accent reduction and specifics for first-language learning needs. 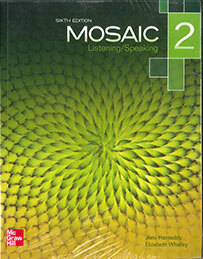 Interested in being notified about future offerings of COMM 0030 - Speaking and Listening Skills for ESL Students 2? If so, fill out the information below and we'll notify you by email when courses for each new term are displayed here.